Benjamin Fortunado Marcune was born in New York on March 30, 1935. He attended UCLA and earned a Masters Degree in Human Factors Engineering from the California Institute of Technology. He is also a Fellow of the Pennsylvania Academy of Fine Arts. After serving in the Army in Korea, Ben enjoyed a successful career as a biomedical engineer and industrial designer. Ben's creative drive and his drawing ability were instrumental in his work in the sciences. In mid career, Ben moved to Pennsylvania and attended the Pennsylvania Academy of Fine Arts. 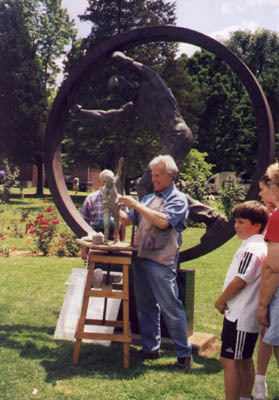 Painting and sculpture commissions began to occupy more of his time and he eventually became a full time artist and sculptor. Between 1993 and 2018, Ben maintained three studios, two in Historic Bethlehem and one in Bucks County. Ben became known for his landscapes of Bethlehem and Bucks County. He was also recognized for his portraits of public figures and performing artists. An extremely versatile artist, Ben also created abstracts, etchings and collagraphs. Ben's heroic size sculptures may be seen throughout Lehigh Valley, Pennsylvania. They include the Workers Memorial, the Steelworkers Memorial, the Korean Vietnam Memorial and multiple sculptures on the campus of DeSales University. Benjamin Fortunado Marcune died on March 3, 2018 at the age of 82. His paintings and other works are available through The Snow Goose Gallery in Bethlehem, Pennsylvania or through this website. For more information contact The Snow Goose Gallery or the executor of his estate at ben@marcune.com.